Provolone (pronounced [provoˈloːne]) is an Italian cheese. It is an aged pasta filata (stretched-curd) cheese originating in Casilli near Vesuvius, where it is still produced in pear, sausage, or cone shapes varying from 10 to 15 centimetres (4 to 6 inches) long. Provolone-type cheeses are also produced in other countries. The most important provolone production region today is Northwestern Italy and the city of Cremona. Provolone, provola, and provoleta are versions of the same basic cheese. Some versions of provolone are smoked. 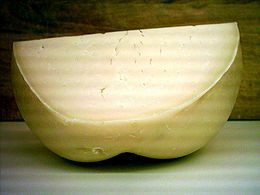 The term provolone (meaning large provola) appeared around the end of the 19th century, when it started to be manufactured in the southern regions of Italy and assumed its current large size. The smaller sized variant is called provola [ˈprɔːvola] and comes in plain and smoked ("affumicata") varieties. Modern provolone is a full-fat cow's milk cheese with a smooth skin, produced mainly in the Po River Valley regions of Lombardia and Veneto. It is produced in different shapes: like a very large sausage which may be up to 30 cm (1 ft) in diameter and 90 cm (3 ft) long, in a truncated bottle shape, and in a large pear shape with the characteristic round knob for hanging. The typical weight is 5 kg (11 lb). Provolone is a semi-hard cheese with taste varying greatly from provolone piccante (sharp/piquant), aged for a minimum of four months and with a very sharp taste, to provolone dolce (sweet) with a very mild taste. In provolone piccante, the distinctive piquant taste is produced with lipase (enzyme) derived from goat. The Dolce version uses calf's lipase instead. Both provolone valpadana and provolone del Monaco (from the Naples area of Italy) have received the DOP (Protected Designation of Origin) seal from the European Union, meaning no country other than Italy may legally produce a cheese called that. In Brazil, Argentina, Bolivia and Uruguay, small discs of locally produced pulled-curd provolone of 10 to 15 cm (4 to 6 in) in diameter and 1 to 2 cm (1⁄2 to 3⁄4 in) in height are sometimes grilled until partially melted and eaten as a starter, often seasoned with herbs. The cheese when served this way is often called provoleta in Spanish. Provolone is also produced in the United States. It finds many uses, including on pizzas and on sandwiches. ^ "Provolone Valpadana Denomination Information". European Commission. Retrieved August 3, 2013. ^ "Provolone del Monaco Denomination Information". European Commission. Retrieved August 3, 2013. ^ Great Chicken Dishes. p. 165. This page was last edited on 21 March 2019, at 00:38 (UTC).